Gary is a long-time enthusiast for the marque who has raced hicam Moto Parillas, found their weaknesses by doing so, and now as a “Toolroom Trained” hobby engineer likes to improve his own bikes with sensible mods & upgrades. Given the savings realised making batches rather than “one offs” he can offer the excess output to fellow enthusiasts at non-profit rates – first come first served. 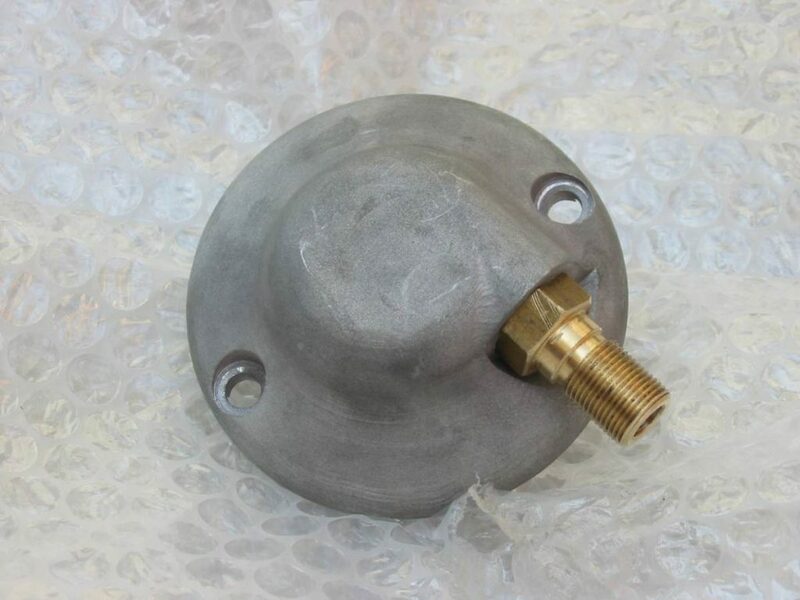 Don’t rely on stock being held as batches are small (10 max) and whilst the parts are offered via my website there is no guarantee that being on here means they are readily available. Please note: Some mechanical & engineering skills will be needed to fit these parts – a Moto Parilla was never made to the same standards of accuracy as a Honda so some fitting skills may be required & indeed should be expected. If you don’t know what “fitting” means or don’t know someone who does then don’t buy the parts! 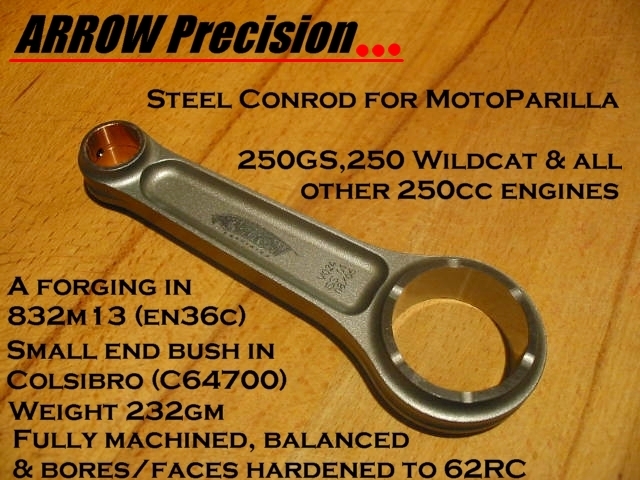 Anyone with a 250 Wildcat or 175GS who used it as intended back in the 60s will no doubt be familiar with the main weakness in that version of the engine – the connecting rod. 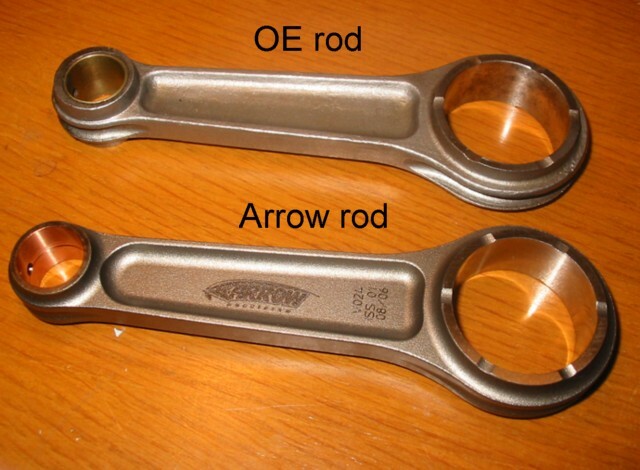 No doubt many bikes remain today with the OE rod in perfectly serviceable condition & some may still be racing. Lucky men! The fact Moto Parilla didn’t use a standard rod in their factory hicam race bikes tells me all I need to know. That & having seen the carnage left by a failed rod hardly makes it a risk worth taking when rebuilding one of these rare & expensive engines. I had a batch made up a few years ago by a highly renowned UK firm – Arrow Precision – which sold out almost immediately. Gary has now had another small batch made. Please Note : This will be the last batch commissioned by any of the Parillisti this side of the pond – between us we have laid out in excess of £10k to get a good price on the rods and meet our own needs for our future restorations. Arrow will make small numbers of rods now they have the design but the cost will be in excess of £400 per rod if you approach them for a “single figure” order. This isn’t a sales pitch its just the truth – when these are gone there will be no more unless you are prepared to deal direct with Arrow & invest a great deal of money with them to get the price right or pay premium prices for a small number of rods. The rods are to exactly the same specification as the previous batch most of which are now in use around the world in race bikes & newly restored GS & Wildcat models. 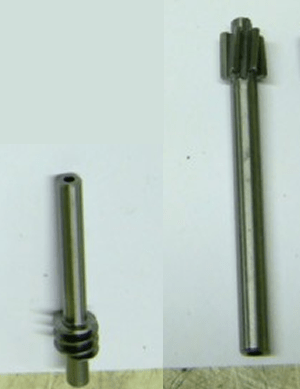 Note Parilla original looks a bit rough in comparison!The material is of far better quality than the original and the rod is a direct replacement requiring no additional machining or alteration to fit a 250 (or 175) crank. The big end will take the original Moto Parilla caged roller bearing or can be fitted with a modern INA replacement available from a bearing factor. £255 each. 32mm or stepped 32/26mm. £55. 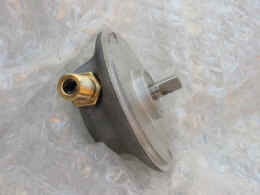 If supplied with Arrow rod only £35. Ever found an unbutchered gearbox sprocket nut on a Hicam? Me neither. New ones have been made by Gary which are slightly deeper allowing the odd locking washer to be omitted & a drop of Loctite used instead. 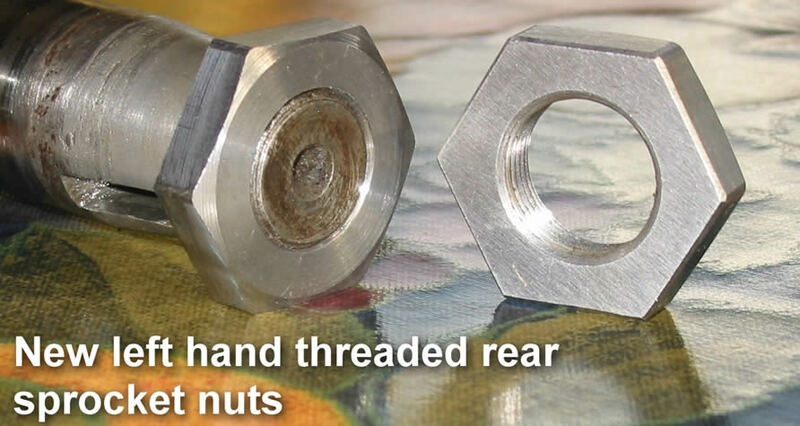 The deeper nut also gives better purchase for a socket. 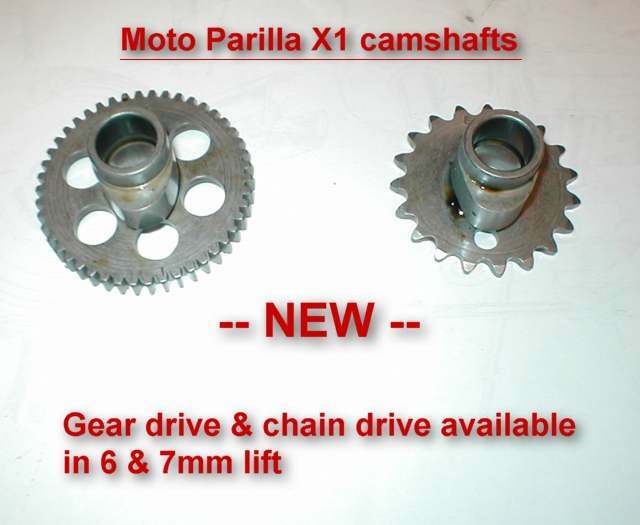 The ultimate performance & reliability upgrade for a road or racing Moto Parilla High Cam engine. Everything you see in this picture is supplied. 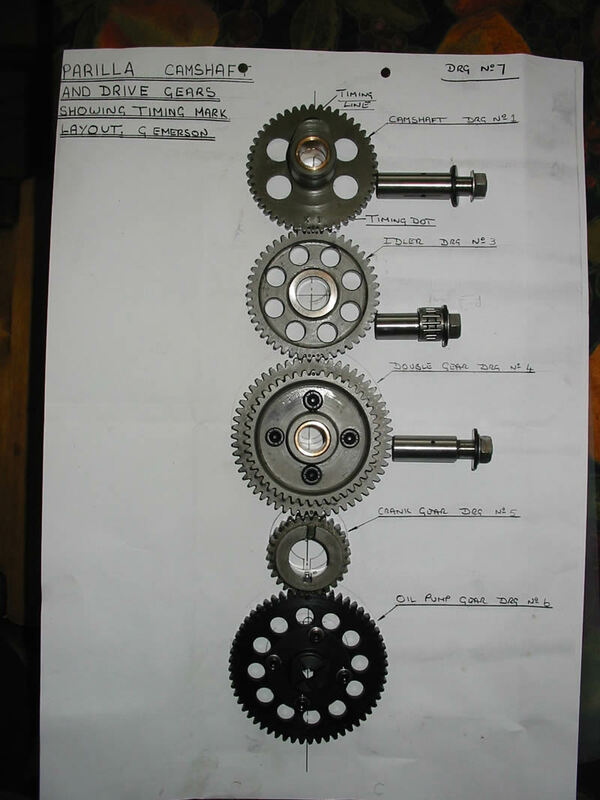 Gear drive conversion. 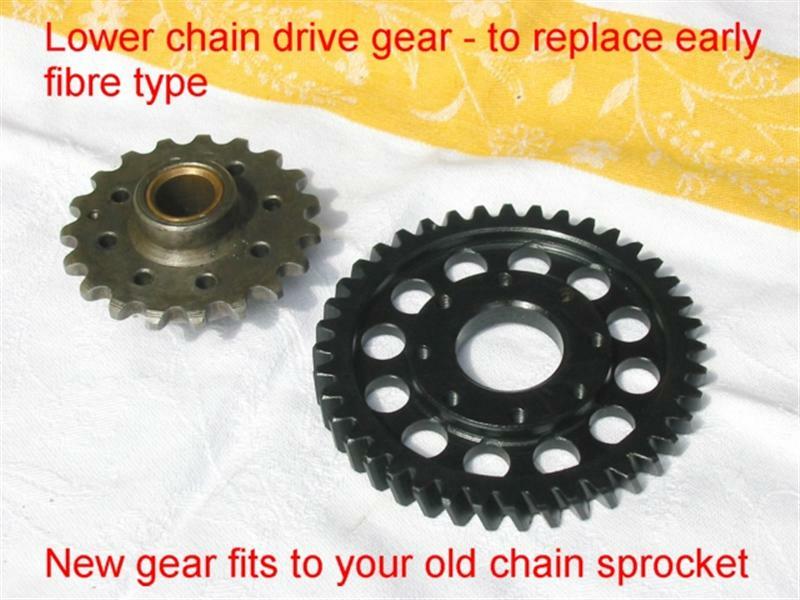 Replaces the chain and helical gear system as fitted to the road going models. No more chain or adjuster worries. 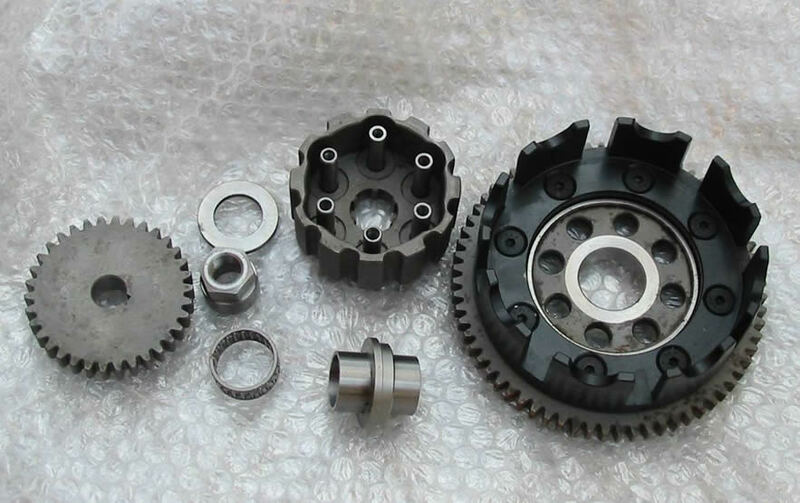 Comes with camshaft, all gears, bearings, pins etc. £650 for the complete kit as shown. 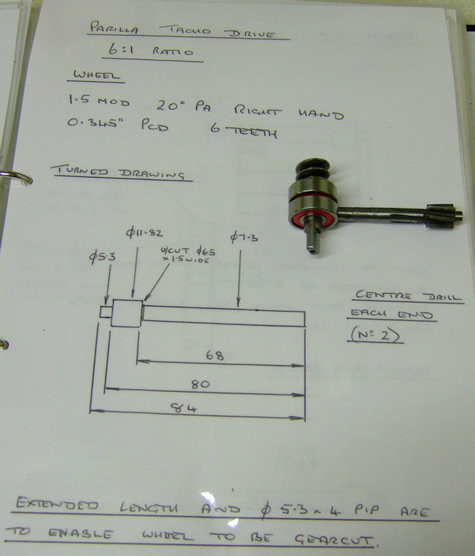 Please note some machining may be required, which can be done at extra cost. All drawings supplied if you can do your own. Send the timing cover & its inner crankcase half. The packaging you send the covers in will be the packaging used for their return – ensure it is a robust job. Please specify which pin you require in the train. 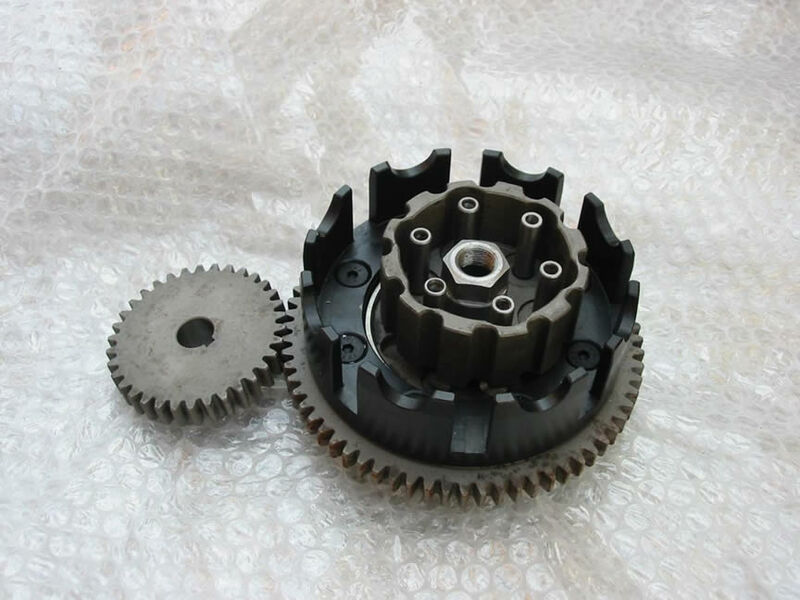 Comprises of primary gear, clutch gear, basket, centre, bearing and sleeve, nut, pushrod. Easy to fit, transforms the bike. More details on Nova Racing Clutch page. Replica of correct 6:1 ratio and indistinguishable from the outside from an original. Purposely left blank on inner face to show it is a replica. This is a nice piece of equipment, made from better material than the original Smiths ever was. Sealed for life. 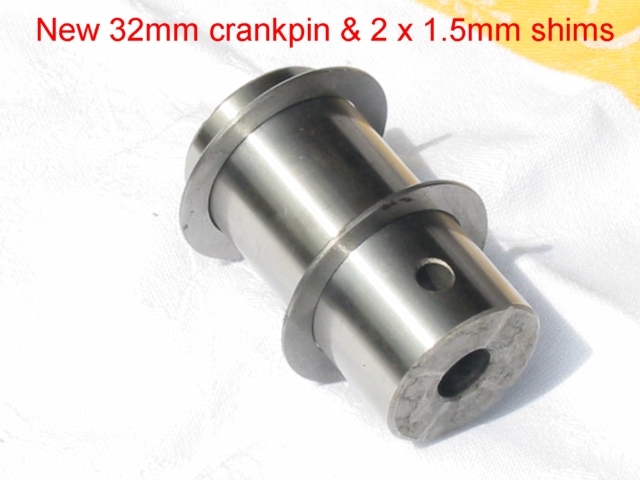 Replacement cam & idler spindles for the high cam chain & gear drive engines. 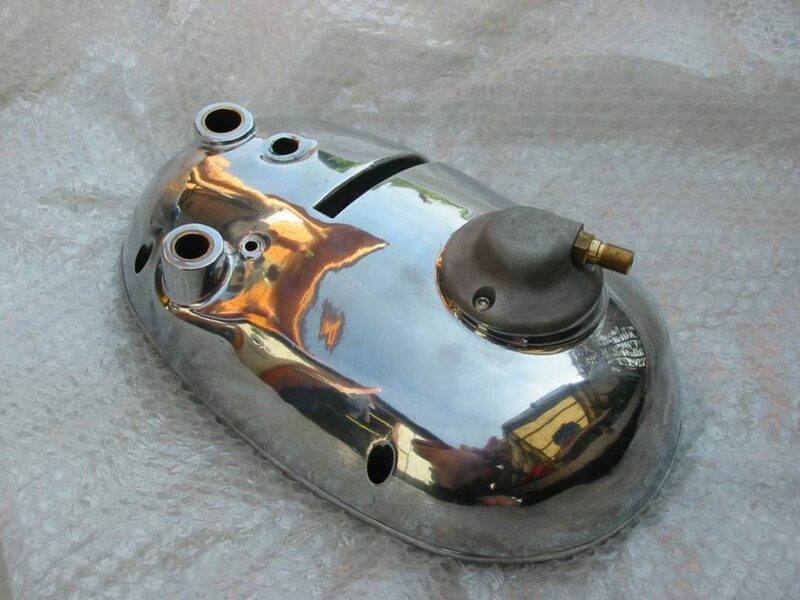 Usually worn in any old engine these are quality replacements made in EN36, case hardened & ground to size. UK£20.00 per pin plus P&P. Some owners have original boxes with worn gears. Be aware that the input gear bearings can be a little loose in the housing due to wear or poor machining on the original bodies. High strength retainer cures this, (or you cold buy a new body). Comes with worm and wheel at 6:1 ratio and 2 sealed bearings. X1 to a modern profile available, other profiles can be made, but turnaround is approx 3 months. 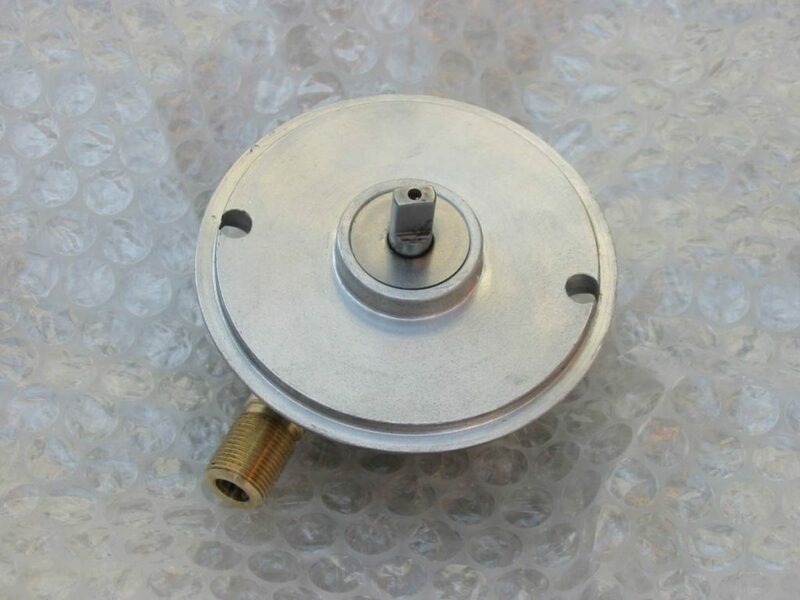 You can use the old steel centre from the fibre gear or purchase a new replacement should you wish to keep the OE unit intact for use as a paperweight or conversion into a handy pie crust crimper.